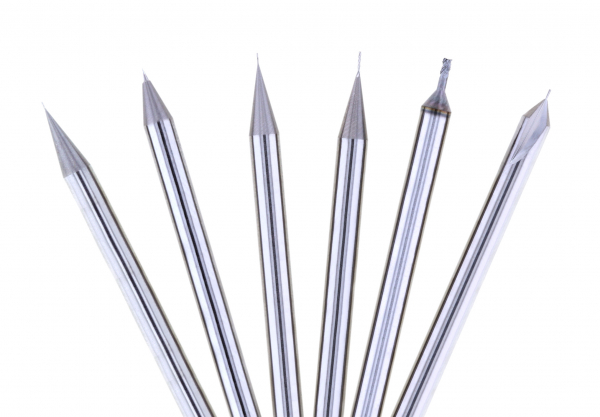 We offer a wide range of precision tools in the field of micro machining. Standard or special, our micro-mill bits have the latest technological developments: variable and asymmetrical helix angle, irregular indexes, surface treatments, etc. Complemented by a large selection of PVD and CVD coatings, our range of micro-tools offer an ideal solution for every application. These micro-mill bits are complemented by a range of engravers, micro-drills, micro-reamers and whirlers. We offer a wide range of micro-mill bits, designed to meet the different constraints. Our rough micro-milling bits guarantee optimum chip flow in the different machined materials, while our finishing micro-milling bits offer the perfect precision to the final precision of your product. Superfinishing micro-milling bits allow a perfect surface condition especially in the watch industry, medical or aeronautics. We also manufacture engraving tools of high geometric precision used for watchmaking and jewelry as part of crimping.